All praise and thanks are due to Allāh, the Lord of the worlds. Peace and blessings be upon our Prophet, Muhammad, his family and all his Companions. The following is a clarification of the rulings concerning Zakāh al-Fitr, this great symbol of Islām, for Muslims. 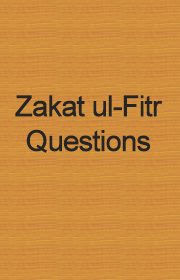 A question and answer regarding Zakat Ul-Ftr presented by by Shaykh Muhammad Ibn Saalih Ibn ‘Uthaymeen.